Written by Rudyard Kipling in 1894, The Jungle Book is actually a collection of stories. For this reason, the cast of characters from The Jungle Book must be divided according to the chapter or story they appear in. A brief synopsis of each chapter and detailed information about the characters is designed to improve comprehension for the reader. This story depicts a young boy named Mowgli the Frog, who is raised by a pack of wolves after wandering into the den of a wolf family. He learns the ways of the jungle from two mentors – a bear named Baloo and a black panther named Bagheera – until he is eventually expelled from the pack in a power struggle between Akela and Shere Khan at the Council Rock. The Jungle Book characters introduced in this first chapter, or story, will resurface later in subsequent stories. Father Wolf – This is who first encounters the man cub (later called Mowgli) in the jungle. Father Wolf brings the baby into the den, so that Mother Wolf can take a closer look. Mother Wolf – Also referred to as “Raksha” and “The Demon,” she immediately bonds with the man cub (Mowgli) and becomes his protector. Tabaqui – The jackal. Also referred to as the “Dish-licker.” The narrator explains that they are despised in India because they run around telling tales and acting mischievously but that they are also feared because the jackal has a tendency toward “dewanee” – or madness. Shere Khan – This is the tiger who is hunting the man cub. He has other names in the story, as well: The Big One and Lungri, which means “the Lame One.” He is called the Lame One because he was born with one lame foot. Shere Kahn threatens to one day kill Mowgli. Mowgli – Named Mowgli the Frog, this human boy is the main character of the story. He is raised by Mother Wolf, Father Wolf and their wolf pack. Akela – The great gray Lone Wolf is the leader of the Seeone Wolf Pack. Once strong and cunning, Akela has grown older and is therefore deemed weaker. While he initially agreed to include Mowgli in the pack, his authority is eventually challenged. Baloo – The narrator mentions that Baloo is the only animal besides the wolves who is allowed to take part in the pack meetings. This is because this gentle brown bear is responsible for teaching the young wolf cubs the laws and ways of the jungle. Bagheera – This black panther convinces the skeptical wolf pack to accept the man cub into its tribe for the price of a bull. The reader later learns that Bagheera was not born in the wild. Instead, he was born captive, and remained so until one day he realized that he belonged in the jungle, with his animal brothers. The panther explains that this is the reason he paid the price for Mowgli to join the wolf pack instead of being turned over to Shere Kahn – so that Mowgli may once again join the men who are his brothers. Bagheera continues to take a special interest in Mowgli as he grows from a baby to a young boy. This second chapter or story takes a closer look Mowgli's childhood in the jungle – specifically, the lessons he received from Baloo and Bagheera on the ways of the jungle. While many in the cast of characters reappear here, several new ones are added. Bandar-Log – These are the gray apes who populate the jungle. They are also referred to as the Monkey People. Mowgli is taught that the animals of the jungle are forbidden from socializing with the Bandar-log, because of the way the Monkey People behave. Mowgli does not obey this lesson, and eventually the Bandar-log kidnap him because they want his continued attention and the status it gives to their kind. Jungle People – This phrase is used in reference to the various animals who make the jungle their home. Chil the Kite – This is the bird who helps Mowgli by pinpointing his whereabouts and alerting Baloo and Bagheera of the location. Kaa – The Python snake who is feared by many – especially by the Monkey People. He joins forces with Baloo and Bagheera to rescue Mowgli. Poison People – This is the name given to the poisonous snakes inhabiting the jungle. In this story, or chapter, the reader learns what happens after Mowgli is exiled from the wolf pack. Determined to return to his own people, Mowgli continues on until he encounters an Indian village far from the jungle where he had once lived. By chance, it is the village where his real mother and father live, and they are reunited. Once again, there are several new encounters in the cast of characters from The Jungle Book stories shared thus far. Messua – Mowgli’s birth mother and wife to the richest man in the village. Nathoo – Mowgli’s given name at birth. Gray Brother – This is the oldest of Mother Wolf’s cubs. He finds Mowgli outside the village to warn him that Shere Khan has vowed to kill Mowgli. Buldeo – The old village hunter who likes to tell stories and tall tales. Rama – The great bull of the buffalo herd. Mowgli uses Rama to herd the buffalo – and eventually to lead a stampede which kills Shere Khan. Here, the reader encounters an entirely new cast of characters as Kipling tells the story of a white seal named Kotick, who leads his brother seals to the safety of an island where man cannot reach them. Limmershin – A Winter Wren who the narrator befriends. It is from Limmershin that the narrator learns of the adventures of Kotick. Sea Catch – A fifteen year old, very large gray seal. The narrator tells the reader that Sea Catch is scarred from numerous fights defending his territory by the sea set aside for his nursery, but that he is also ready and capable of fighting again. Matkah – Sea Catch’s wife. Kotick – Matkah’s baby, Kotick is the main character of the story. Early on, Matkah realizes that her baby will have a white coat – which is quite an anomaly for the seals. Kerick Booterin – An Aleut, he is the chief of the seal hunters. Since white seals are quite rare, Kerick believes that Kotick may be the ghost of another white seal – Zaharrof. Patalamon – Kerick’s son. Patalamon learns from his father that Kotick may be bad luck because of his white coat. Sea Lion – Kotick meets Sea Lion after seeing many of his friends slaughtered on the beaches at a place called Sea Lion’s Neck. Sea Lion points him toward a place called Walrus Inlet, and tells him to look for a walrus named Sea Vitch when he gets there. Sea Vitch – An old, large and ugly walrus. He tells Kotick he knows of no place without man, and suggests Kotick go speak to Sea Cow, for surely Sea Cow can lead him to such a place. Rikki-tikki-tavi is a little mongoose befriended by a young boy and his parents. Rikki is one of the most lovable of The Jungle Book characters. A loyal pet, he saves the family on more than one occasion from a dangerous cobra and the cobra’s wife. Rikki-tikki-tavi – The mongoose is the main character in the story. Teddy – The small boy who finds Rikki-tikki-tavi and cares for him. Teddy’s Mother (Alice) and Father – Each play small roles in the story. Darzee the Tailorbird – A friend of Rikki’s. They meet after one of Darzee’s babies falls out of the nest and is eaten by Nag. Darzee’s Wife – A little wiser and braver than her husband, she helps Rikki trick Nagaina, the snake. Nag – The big, black cobra living in the yard who tries to kill the boy and his family. Nagaina – Nag’s wife. She is described as being very wicked, however, her utmost concern is preserving her brood. 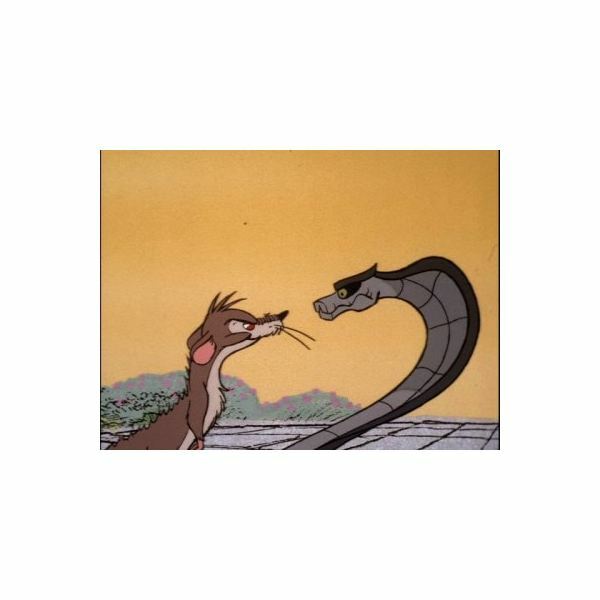 Karait – The brown snake Rikki kills when it threatens Teddy. Chuchundra – A muskrat Rikki encounters who delivers a somber warning that those who kills snakes are destined for retaliation. Chua – Chuchundra’s cousin, the rat. Chua is menitoned, but does not play a significant role in the story. The Jungle Book characters in this chapter center around the story of Little Toomai, who helps his father care for the elephants used as service to the Indian Government. One night, after seeing one of his favorite elephants – Kala Nag – slip away during the night, Little Toomai follows along. When they boy relays to the other elephant hunters what he saw at the end of the journey, he is saluted by one and all. Kala Nag – A service elephant for the Indian Government. Radha Pyari – Kala Nag's mother. Big Toomai – Kala Nag's driver – son of Black Toomai (who had caught Kala Nag), and grandson of Toomai of the Elephants (who had supervised the capture of Kala). Little Toomai – Big Toomai's 10 year old son, and the main character of the story. Little Toomai is privileged to see what very few have seen before – the dance of the elephants. Petersen Sahib – The head of the stockade (Keddah) operations, the narrator tells us that Petersen Sahib is in charge of catching all of the elephants the Indian Government uses for service. He is also a powerful white man, and for this reason, Little Toomai is afraid of him. Pudmini – The clever female elephant belonging to Petersen Sahib. Machua Appa – The head elephant tracker. In this last story, The Jungle Book characters are once again mainly animals. The human narrator is in Rawal Pinki to observe a review of thousands of troops including men, camels, elephants, horses, bullocks and mules for the Viceroy of India and his guest, King Amie of Afghanistan. He is sleeping in a makeshift tent for a night after being driven away from the army camp by a ruckus. While he is trying to sleep, the animals of the camp – who have also been driven away – unknowingly come upon him. The narrator is able to understand the animals as they commiserate about their roles as servants to the Indian Government. The Narrator – Little is said of him, other than he is an Englishman, and he has picked up the ability to understand camp animals language from the natives. Little Vixen – The narrator's fox terrier. Billy – An old battery mule who has also been driven away from the camp for the night by the noise and upset. Gun Bullocks – Oxen bulls used on the front lines to drag the large gun cannons when the elephants are too afraid to go any closer. Two of these bullocks talk with the other animals as they spend the night away from their lines. Haybale – A camel to whom Billy spends the night talking with. Australia – The troop horse who also joins in the conversation. 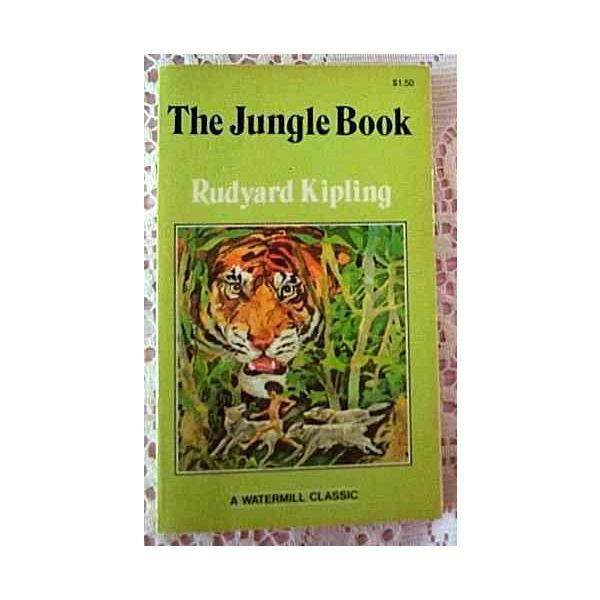 Readers were most likely both enthralled and entertained by the cast of characters from The Jungle Book stories Kipling shared, for the wilds of India and the jungle were popular motifs of the time. This fascination still rings true today and explains the continuing popularity of this classic novel. Kipling, Rudyard. The Jungle Book. Mahwah, New Jersey. 1980 Watermill Press.